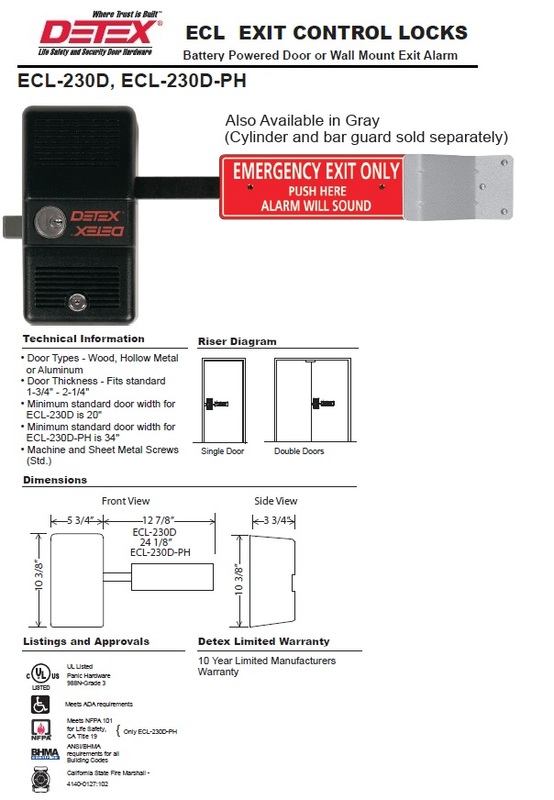 The ECL-230D is a code compliant, battery alarmed, rugged dead bolt, panic device with steel plate and photo-luminescent sign providing managed security and a 100 decibel alarm for secondary exits. Deters employee and customer theft. Attack resistant design withstands over 2200 lbs. of outside pull force. Easy to see status lights. Resetting the alarm can only be accomplished using the control key. Locking and unlocking the deadbolt always arms and deactivates the alarm. Durable Steel Plate w/ photo luminescent sign (glow in the dark). Available in Grey and Black for matching existing and new designs.